A method of manufacturing methamphetamine, designed to get around laws restricting the sale of the ingredients needed to make meth is even more dangerous than the old makeshift meth labs, authorities say. Also known as the "one-pot" or "shake and bake" method, in this scenario meth is produced in a two-liter soda bottle. A few cold pills are mixed with common but harmful household chemicals, producing enough meth for the user to get a few hits. The old meth labs required hundreds of pseudoephedrine pills, containers heated over open flames and cans of flammable liquids. The cooking process created foul odors making the labs difficult to conceal and often sparked explosions. The shake and bake method requires only a few pseudoephedrine pills, circumventing laws passed restricting the sale of large quantities of over-the-counter decongestants, cold, and allergy remedies. But the shake and bake method is in no way safer than the old meth labs. If the bottle is shaken the wrong way, or if any oxygen gets inside of it, or if the cap is loosened too quickly, the bottle can explode. If the old clandestine meth labs caught fire, the "cooks" would just run away. But with the shake and bake method, they are actually holding the bottle when it explodes. Police have linked dozens of flash fires — some of them fatal — to meth manufacturing. Police departments across the nation are training officers how to handle the new mobile labs if they encounter them during traffic stops. If an officer doesn't know what he or she is looking for, they may unwittingly spark a fire. Since the mixture in the bottle can catch fire when exposed to oxygen, even an act as simple as unscrewing the cap to see what's inside (since it looks like an ordinary soda bottle), can be potentially life-threatening. After years of declining numbers of meth labs being busted by law enforcement, due to the laws restricting the sale of pseudoephedrine, seizures are suddenly increasing again. The new shake and bake labs put everyone in danger because they can explode while the drug users are driving around, putting other drivers in danger. The old labs were usually concealed in secluded or rural areas because of the odors, but the new "labs" can be anywhere. The discarded soda bottles used in the process are also dangerous. Police have found them in ditches, in people's yards, and inside dumpsters. 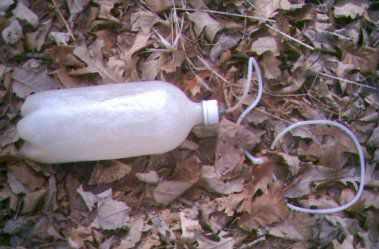 Authorities suggest that people who find discarded bottles containing an unknown mixture leave them alone. Do not open them or pick them up. Call the police and let them investigate to see if it's a danger. And with all illegal drug activity, don't try this at home. Meth labs are dangerous enough, but putting toxic chemicals in a soda bottle in a confined space like a car isn't just a recipe for meth, it's a recipe for disaster.